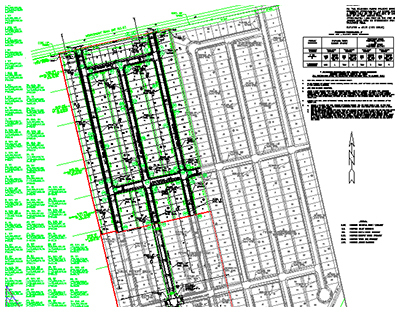 GC Engineering, Inc. was responsible for professional engineering services and master planning related to paving, platting, water, sewer, and drainage for Hunter’s Creek Subdivision Section 1. Work included design of water, sewer, and storm drainage systems for Section 1 of the subdivision, design of a new sanitary sewer lift station, a 100,000 gpd STP including the waste discharge permit and design of a sanitary sewer force main to the proposed sewage treatment plant. In addition to the new 5,000 feet of water line within Section One, GCE designed and performed project management services for a new, offsite 2,500 linear foot of 12” water line along Needlepoint Road. The water distribution system was designed to meet domestic demand (approximately 600 connections). GCE coordinated the design and analysis approval and permitting with HCFCD and the City of Baytown. GCE also prepared construction plans and contract documents, and provided assistance during bidding and construction.